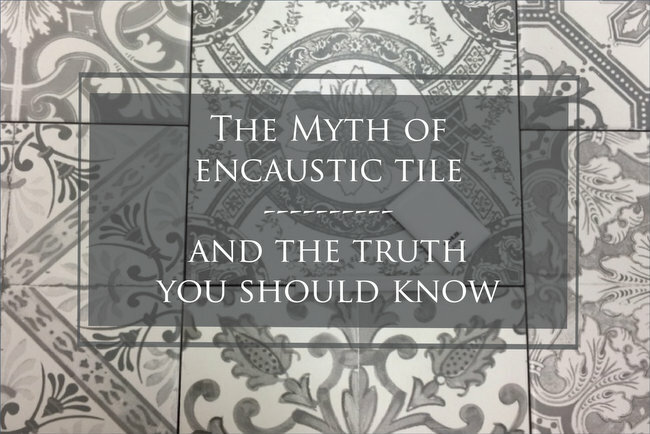 There’s a lot of confusion about the encaustic tile trend, so I decided to do my research and let you know what I learned. 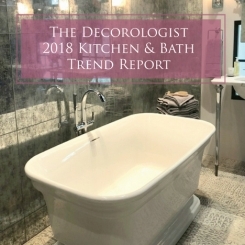 The popular tile we are seeing all over the kitchens and baths may be either cement or ceramic. I understood that the cement versions are actually “encaustic,” while the ceramic ones are simply ceramic versions of the look. That cement tiles are the real thing, and ceramic ones are essentially knock-offs. The word “encaustic” refers to a process of painting with a beeswax-based paint and then fixed with heat. The word is from the Ancient Greek meaning “to burn,” which describes the process they used in painting and enameling thousands of years ago. In medieval times, what was called inlaid tile was made up for different colors of clay. They were inlaid together in a pattern, then fired in a kiln so that the design remains as the tile is worn down. It was widely used in the 13th through the 16th century in monasteries and churches. Although it pretty much disappeared for a couple hundred years, this kind of tile regained popularity during the Gothic Revival period. THAT’S WHEN THE MISTAKE WAS MADE. I’ll explain in a moment. Minton’s Ltd. became a big supplier of this tile for public buildings and palaces in mid 1800s. Although this ceramic tile was also popular in America until about 1930, England had the most prevalent inlaid tile installations because Minton tile was an English company. 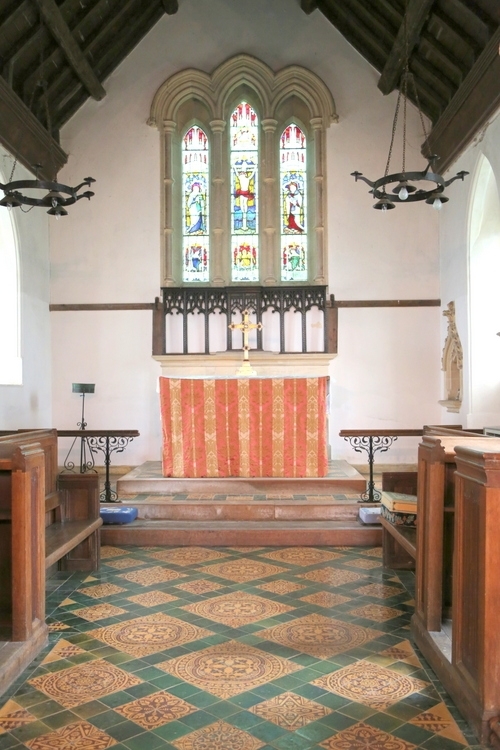 Prince Albert was said to have commissioned Minton tilework many times during Queen Victoria’s reign. 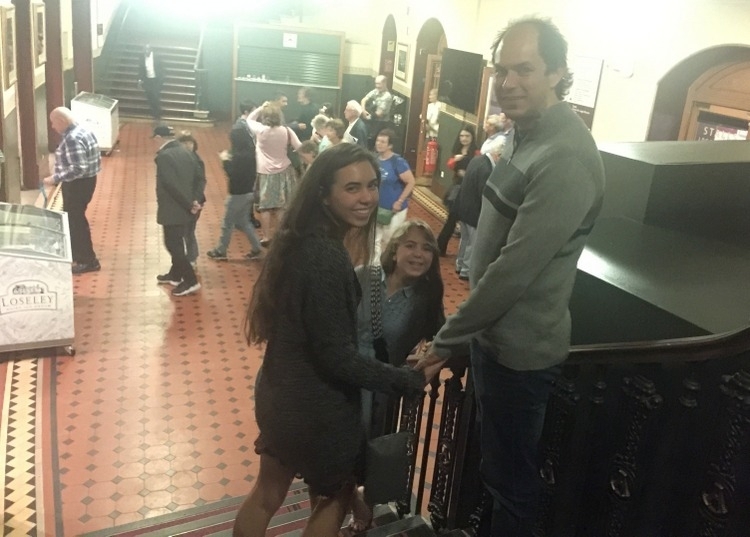 This is a photo of my family at Royal Albert Hall in London last summer. I’m guessing the tilework here is Minton! Victorians mistakenly began calling it encaustic tile because it looked like the enamel work of the ancient Greeks. The truth is, it wasn’t truly encaustic because there was no wax involved. It was actually inlaid ceramic tile much like that made in medieval times. But the term “encaustic” has been misused ever since. 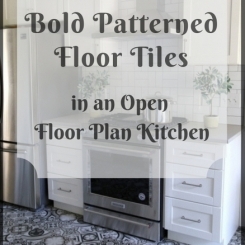 Is cement tile the same as encaustic tile? NO. Cement (or more accurately, concrete) tile is made from Portland cement and is compressed, rather than fired like encaustic tile. Pigmented cement is hand poured into decorative molds until it sets, then the tile is removed and compressed under 2,000 pounds of pressure. It’s not encaustic because it isn’t made of clay, nor it is fired. It is typically made in 8×8 inch squares. 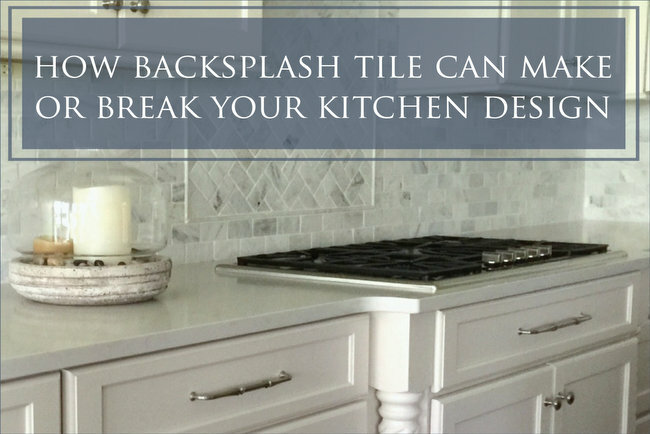 They’re installed in the same manner as ceramic tile, with one major difference. Cement tile needs to be sealed with two coats of penetrating sealer after it’s been set but before grouting. There is dry time in between, and the entire process takes 10+ days. Cement tile was first made in the south of France in the mid 1800s. It’s also known as Victorian, Mission, or Cuban tile. I suppose both ceramic and cement tiles were popular at the same time in Europe, and likely both referred to as “encaustic” tile. Is ceramic tile encaustic? NO. But, you could more accurately say that unglazed ceramic tile is most similar to medieval inlaid tile (which were later referred to as encaustic tile). Ceramic tiles are made with clay and can be either glazed or unglazed, and are fired in a coal or wood fired kiln. Unglazed tiles are true inlaid tile. They are baked pieces of clay whose colors run throughout the material. Tiles are more limited to earthy tones, but some manufacturers mix in color pigments in the clay. Unglazed tiles are thicker and more dense (which means less absorbent) than glazed ones. Glazed tiles are made the same as unglazed tile except that a wear-layer, called a glaze, is fused to its surface by means of high heat. The glaze makes it possible to produce unlimited colors and designs. The glaze can vary from matte, satin, and high gloss. Ceramic tiles were once made by hand. Wet clay was put in a wooden mold, and then left to dry in the sun or fired in a small brick kiln. While a few artisans still make ceramic tiles by hand, the majority of ceramic tiles made today go through a process known as dry pressing or dust pressing. So most of ceramic tile made is no longer fired, so does that mean it doesn’t qualify as inlaid anymore? I honestly don’t know. What I do know is that it’s not likely that ANY of the new tile that are being manufactured now are truly encaustic tile. The term really just refers to a “look” now. The term is used for a tile that is multi-colored and boasts various patterns, symbols, or floral motifs. 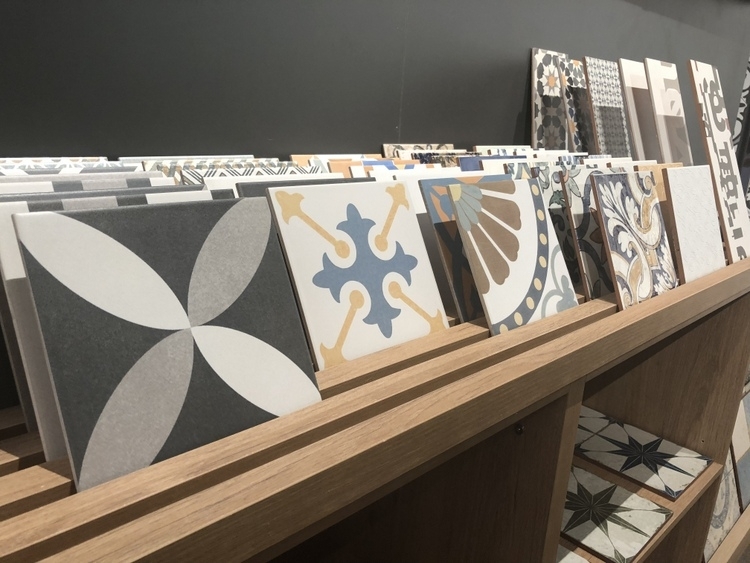 Now that you know more than you ever thought you wanted to know about so-called “encaustic tile,” want to know if you should choose cement or ceramic tile for your project and why? Cement (or more accurately, concrete) has more of an authentic, old-world look. It lasts considerably longer than ceramic (try a couple of generations), is nonslippery, and can be completely customized. Cement acts as a great insulator and is a superior option for heavy commercial use. 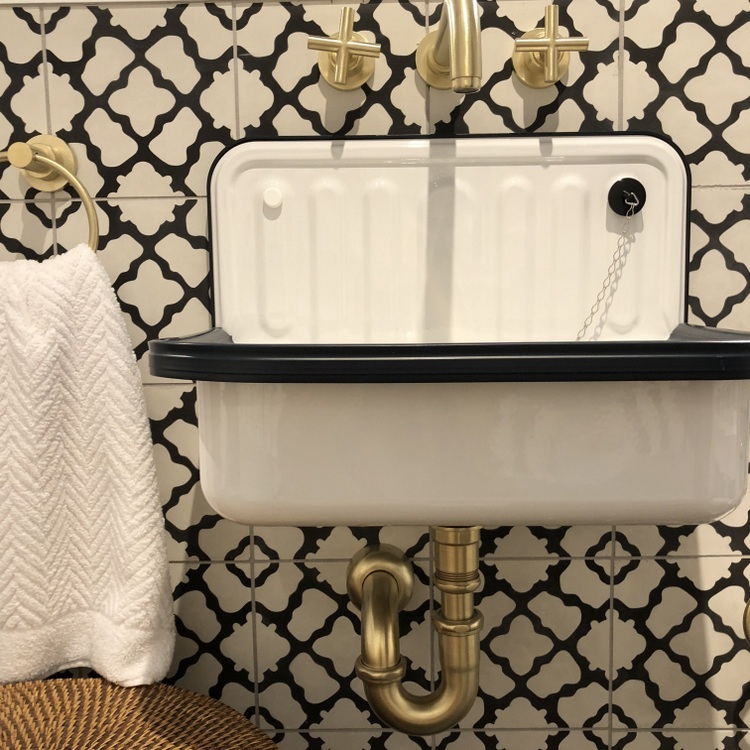 Cement tile is more expensive ($10-$30 per square foot), quite heavy (an 8 inch tile is about 3 pounds), stains easily, and is prone to etching by acid or harsh detergents. It can’t be used outdoors in areas subject to hard freezes. 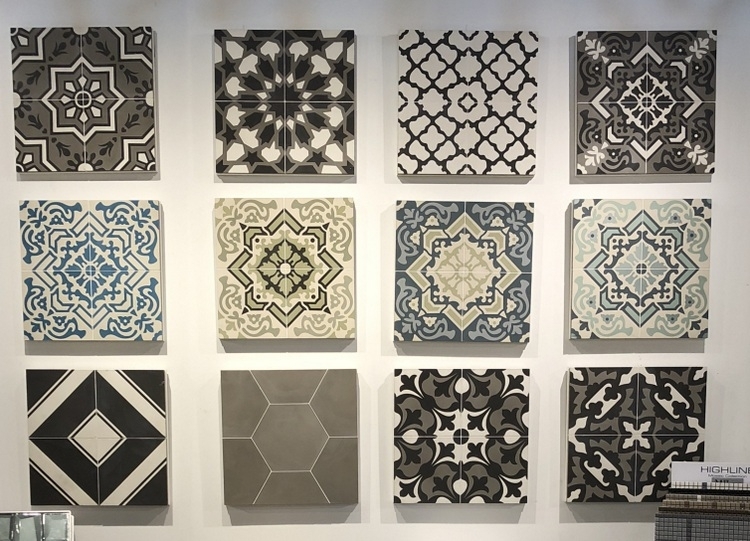 Cement tile requires an experienced installer and must be sealed on installation in a multi-step process (takes up to 10 days), and requires periodic resealing. Glazed ceramic is the most stain resistant kind of building product there is. It’s water resistant, hygienic, and is completely fireproof. It won’t fade with light. If it’s glazed, it’s non-porous and is practically stain-proof. Ceramic is reasonably priced and ranges from $2-$12 per foot. It’s less maintenance than cement, and you can choose different glaze sheens for different looks or applications. Glossy tiles chip more easily and can be slippery. They are best for walls and light traffic. 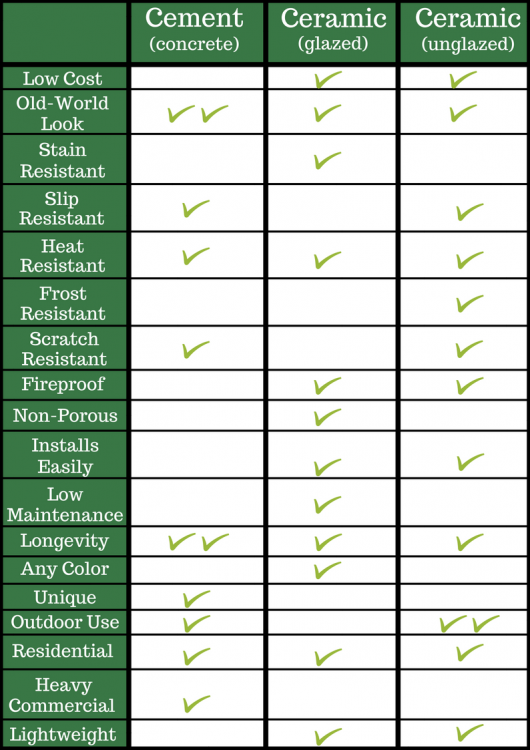 Choosing a matte glaze can give you the chip and stain resistance you want while providing slip resistance on floor applications. You can use unglazed ceramic outdoors in any climate, and it’s a good choice if you’re looking for a slip resistant surface in an area like a laundry room or kitchen where the tile is likely to be subjected to high amounts of moisture. Unglazed ceramics are scratch resistant and provides a similar, earthy aesthetic as cement tile. I got my info from various sources, especially here, here, here, and here. Since ceramic tile varies in things like water absorption, chip and wear resistance, wall vs. floor suitability, and commercial suitability, be sure to research the properties of specific ceramic tile you are considering. This is a good resource if you need to know what to ask. What started off as a simple Google search ended up sending me down a rabbit hole, determined to get to the bottom of things. I’m not entirely sure I did, but if you have any more relevant info, please let us know! Stay tuned for the before/after of a recent kitchen and a upcoming bathroom project using encaustic-look ceramic tile. This entry was posted in Decor Addiction and tagged 2018 trends, bath trends, cement tile, ceramic-tile, encaustic, encaustic tile, inlaid tile, kitchen trends, somertile, tile. Wow I had no idea. This was super interesting. I too thought encaustic and cement were one and the same! 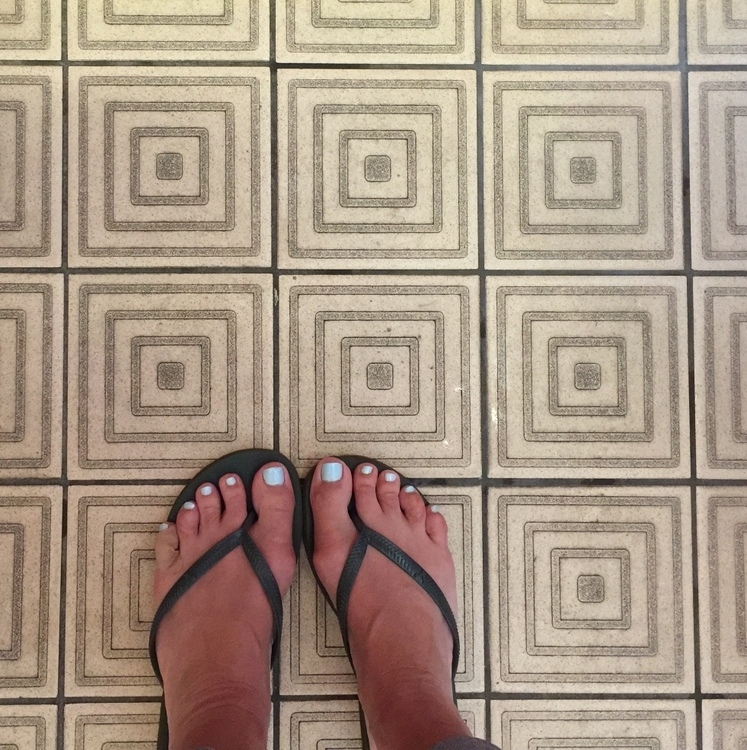 Either way, I LOVE my cement tile. Would choose it again in a heartbeat! Ok, so tell me more about your cement tile. How and where are you using it? When did you have it installed and what do you love about it? Thanks for your input! Amazing and informative post- SUCH great info!! Thanks for the information Kristie. 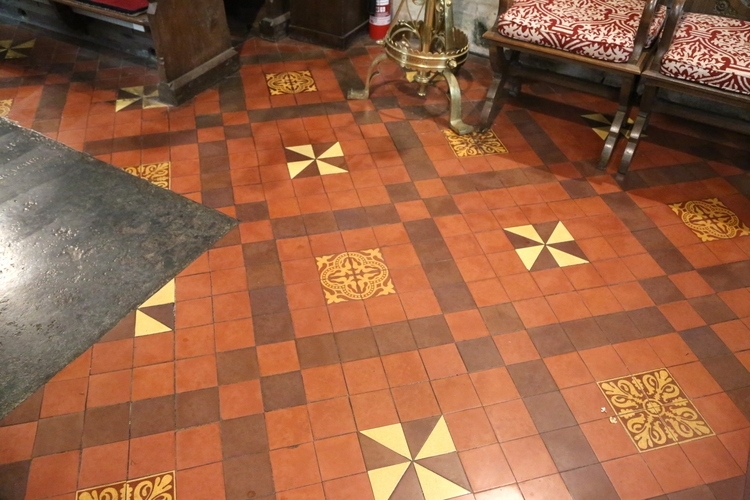 I’ve always wondered about encaustic tiles and found some more info from here http://www.theantiquefloorcompany.com/History_of_the_Antique_Tile/ I would certainly love to have some of the old original encaustic tiles on my floors! Thank you for the link to that interesting article about how they were made centuries ago, Michelle! Wouldn’t it be fabulous to have an outdoor stoop or path paved with those tile? Ceramic, of course (now we know)! This is just the info I needed. Saved me some research. Fabulous post, Kristie. Thanks! This is a fantastic article Kristie! I have pinned your chart as it will be super helpful when working with clients! Thanks, Kristie! I knew I could count on you to educate me on the latest tile trend. I’m going to sound so smart!! Thank you so much for sharing this information and shedding some light on the differences in the tiles. I really appreciate you sharing your knowledge with me and my readers so that we can better understand cement mosaic tiles! Great post! Most of the non-cement pattern tiles on the market are actually porcelain tiles not ceramic tiles. Also cement tiles have to be mudset not regular thinset when installed because they are thicker than porcelain or ceramic tiles. This is much more labor/material intensive and more expensive. I’m a custom home builder and had to chime in. Thank you so much for your input, Amy Lynne. The difference in the mudset/thinset is very important to know! Great post – thank you for doing the research and the explanation!